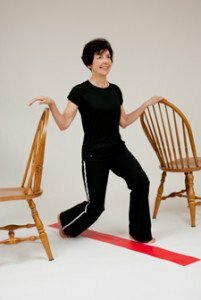 The Reverse Lunge exercise between chairs is part the Exercise for Better Bones Beginner level. You will need a couple of sturdy chairs to do the reverse lunge exercise. I have drawn a line to guide me. If you happen to have perfectly lined patterning, you can work from that or tiles in your kitchen. The purpose of the line (or guide) is to keep your feet equally away from the mid line when you step back, as when you’re standing. You’re going to start with your feet apart. Take a nice breath in, slowly gently exhale as you step back. You still want to be that nice distance away when you go down towards your back leg. You want to focus on your ear, shoulder, hip, and back knee being as straight as you can in that alignment. I’m not dropping my heel in the back. I’m going on to the balls of my foot. For a lot of my clients that are a little bit older they may have some arthritis in the big toe, so they find it much more comfortable doing the reverse lunge with the running shoes on, so there’s less stress on the toes. If you’re going back into your reverse lunge to only go as deep as you feel safe. Make sure that your knees aren’t complaining at you. Your muscles in the front, your quadriceps, or the the hip flexors might be tight. I’d really advise you that you do those stretches (in the Flexibility section of Exercise for Better Bones) before doing the reverse lunge. This is because when you look at the position that my body is in, it is a great strength in the exercise. I’m also getting a stretch for the muscles in the front of my hip and thigh. If I’m am both strengthening and stretching at the same time, it can sometimes feel a little overwhelming. Make sure you do those stretches first. Ideally all these exercises are done in front of the mirror. This gives you lots of feedback in terms of where your body is in space. I’m going to place the stick just as I did with the squat, in front of my second toe in the front. When I take my step back I want my knee, again, just as I do with the squat. I want the middle of my kneecap to line up over my second toe. Similarly with my back leg, I also don’t want it way off to the side or way in. I also want it to line up it with my second toe. With both those things, so it’s much easier to see with the mirror in front of you. I would like to start working out with free weights and the weight machines at my local YMCA. Do you have any videos of safe weight lifting routines and a video on a yoga routine? I feel like some videos would benefit me on yoga and free weights. Thank you.